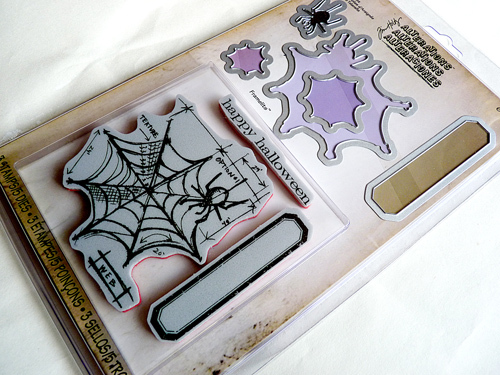 I find myself with an extra set of brand new Cobweb Blueprint Framelits stamps and dies and am offering it as a give-away to one lucky person who links a Halloween project to my linky below. I will keep an eye open for any other die cuts or extra embellishments I might have to add to the parcel when I send it off. So to be in with a chance to win this set please add a Halloween project below which can have been made and blogged anytime in September or up to 6th October this year and be one of my blog, Google+ or email followers. You can enter as many times as you want. I will choose the winner next week on the 6th October at midday (BST) so that I can get it in the post and give you a chance to use it before the spooky season finishes. Good luck and I look forward to seeing your entries. Woohoo! I'm so excited! I will definitely join your play, Brenda! Thanks! Thanks for a chance Brenda! Brenda, what a great thing to see first thing this morning! I've just been thinking how tired my Halloween crafty things are looking to me! For a person who LOVES to create for Halloween, I sure don't have much! BUT, I've never let that stop me from using what I have, so I'll be entering a time or two...or more! You are such a sweetie to share your extra goodies with one lucky soul! My fingers, legs, eyes, and bones are crossed! Hugs!